Besides this being the start of contest season, we also have some other events that you might want to check out. On October 13 through October 15, there is the Makrothen RTTY contest at the club station. See here for more info…. On October 21, it’s the St. Petersburg Science Festival. Look for more info here and at the club meeting but this is a chance to spend a great day on the waterfront in St. Pete showing amateur radio to kids of all ages. 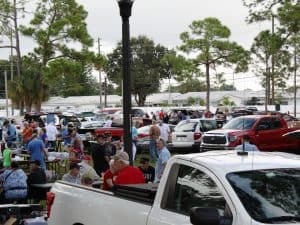 On October 28 in Palm Harbor, is the Upper Pinellas ARC Hamfest/tailgate. More info on that is here. We also have the ever-popular Tampa Bay Hamfest on December 8th and 9th. More info on that hamfest is found here. Check back on this website for upcoming contest operations from the W4GAC SPARC HF Station. As Hurricane season winds down, amateur radio season starts up (he said optimistically…). Hello. I live in Madeira Beach and have been licensed since 1980. I serve SPARC as a board member as well as the club's webmaster. I also do work on the club's remote station. I am active in DXing, contesting, station and computer integration and also enjoy making presentations at the club. SPARC Contesters Operating ARRL Sweepstakes SSB Right Now! SPARC Fest 2018 – a big hit! SPARC Fest – Saturday, Nov 10. Free to all. PROGRAM:Pat, AA0O on Parks on the Air. Next Executive Board Meeting May 25th at 2:00PM at club station. All Members welcome.